Joseph Lelinho, President of Hilltop Honey and in business 23 years, is the winner of many Blue Ribbons & Best-in-Shows at State Fairs. 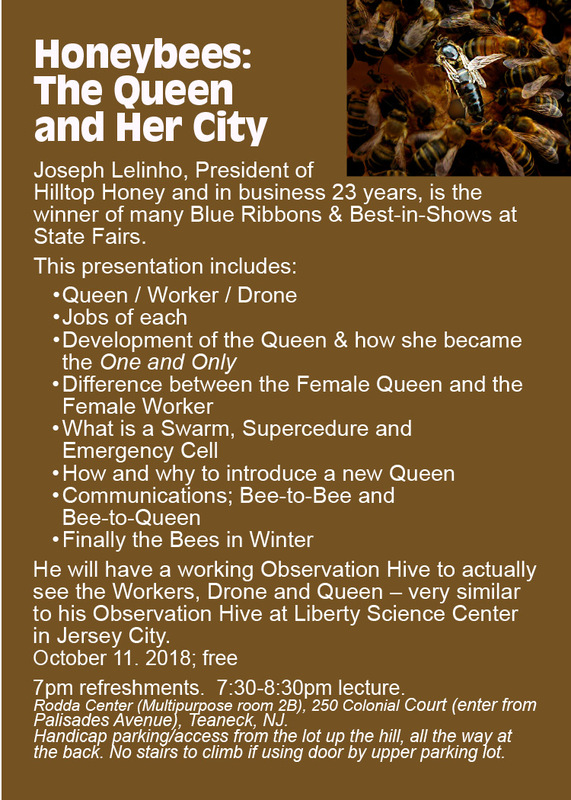 He will have a working Observation Hive to actually see the Workers, Drone and Queen – very similar to his Observation Hive at Liberty Science Center in Jersey City. Rodda Center (Multipurpose room 2B), 250 Colonial Court (enter from Palisades Avenue), Teaneck, NJ. Handicap parking/access from the lot up the hill, all the way at the back. No stairs to climb if using door by upper parking lot.icap parking up the hill, in back, no stairs to climb.) Free; refreshments.